I almost cried today. That's right. Tears welled up in my eyes and my sinuses did that faint stinging thing. Fortunately before I became a slobbery mess I realized the embarrassment I would feel if my office mates saw me crying alone and so I gained my composure. The reason for my near outburst: Christmas music. I know, ridiculous, but I listened to a Christmas album this morning that plucked me from holiday nostalgia and sat me face to face with the incarnate Son of God. 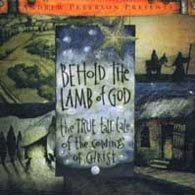 I guess a few years ago Andrew Peterson decided to single handedly rewrite the cannon on Christmas with his album, "Behold the Lamb of God." Joined by Derek Webb, Jill Philips and others on different tracks, he basically wrote a record that takes his listeners through the entire story of the Incarnation. From Moses to Jesus, the grit and glory of Christmas. I've attached a little documentary and some performance songs from the record to give a taste of its goodness. Enjoy. Then go buy it.